This is about effective tactical shelters that I have used in the field including various military issue ponchos, tarps and the Ecotat Multipurpose System. I recognize that today there are quite a few other potential options available but I’m going to stick with what I know works. In WW II and until at least the late-80s the US Military issued two basic shelter items. One was the canvas “Shelter Half” each of which came with (3) wooden poles and (5) aluminum tent pins. These so called “pup tents” were heavy, always leaked – even when new – and required two sets to form a complete shelter. The resulting 2-man floorless tents were intended strictly for bivouacs in relatively secure rear areas and not for the front lines. Other than in basic training I don’t believe any service member ever willingly carried or voluntarily used these things. I’m not sure exactly when these stopped being issued but I don’t think anyone was sorry to see them go. The USGI poncho on the other hand was always a much more popular option. It was considerably lighter than the shelter half. It was actually waterproof and it was simple enough that it could be successfully erected by one person even in the middle of a pitch black night. The OD green poncho was the standard for many years. It was thicker and slightly heavier than the current versions and was quite durable. The lighter woodland type was introduced in the 80s but many “old soldiers” kept using the green ones for some years afterwards. The poncho was not issued with any accessories, but a hunk of 550 cord or some bungee cords was usually enough to construct a functional shelter in a wooded area. However, carrying some kind of lightweight tent pins was also advisable in order to anchor the poncho directly to the ground when necessary. Probably the oddest fact about issue ponchos is that they are only rarely worn as ponchos in modern times. Even in the late 70s we had wet weather tops and bottoms that were usually worn to keep dry while active. The poncho was almost exclusively employed in the field as a sleeping shelter. In fact most people kept the hood tightly tied off to facilitate more rapid shelter construction. Many Allied countries prefer some form of tarp for expedient individual shelters instead. In the US we generally refer to the resulting simple structures as “hooches” while the British refer to them as “bashas”. Basha tarps are generally longer than a USGI poncho and therefore make a relatively spacious shelter that more easily accommodates a soldier and all his gear. Since it has no hood opening the tarp cannot be worn like a poncho. But otherwise the two are very similar in form and function. They all come with grommets and web loops or snaps to provide lashing points and to allow two or more items to be linked together to make larger coverings. Either type can also be readily used as an improvised litter to move a causality or to construct a buoyant “poncho raft” to aid in crossing bodies of water. Mated with a poncho liner or blanket either can be a lightweight sleeping bag or bivy as well. When light discipline is a concern they can be used as expedient blackout screens during map checks and similar tactical activities. The OD green poncho could even be used as a makeshift chalk board. As long as you remember to bring chalk. And if you are in the boonies long enough, you can use your poncho or tarp to form the lining of a field washing machine to hand clean your cloths. The Ecotat Multipurpose System was developed in the 80s by a retired Marine. It does have an NSN and was available for issue for a number of years. Besides M81 woodland they were made in solid coyotish brown and more recently in UCP. The Ecotat concept was pretty audacious, innovative and truly ahead of its time. The idea was to retain all the functionality of the poncho, make it more ergonomic so that it could be worn more comfortably as a garment AND give the soldier the option of constructing a complete modern one or two man tent with the included accessories. The first versions were also made of a brand new space age miracle fabric called Gore-Tex. I have one of the early ones that I acquired around 1984. This was still a few years before the Army began issuing jackets and pants made out of Gore-Tex. It was a very intriguing idea. But for the field soldier in moderate climate zones there just wasn’t much need for the full tent option. And even without the accessories it was considerably heavier than the OD green ponchos most of us were using at the time. Eventually a coated nylon Ecotat was produced that helped reduce the weight quite a bit but by that time the Army had lost interest in making them a general issue item. I couldn’t begin to guess how many Ecotats were fielded or may still be out there in circulation. If anyone has recent experience with them as an issue item I would love to hear it. I believe that all of them were actually produced by Wiggy’s for Ecotat. The Ecotat company itself went out of business years ago. But Wiggy’s still makes these in several colors under the name “Freedom Shelter” although no longer in old style woodland. There are also some cheap knock offs out there made in China I presume. The Ecotat system is not the be all and end all of individual soldier shelters. Still, the idea of a truly multifunctional shelter system has great merit. I would love to see a fully modernized and improved A2 version of these developed. But the fact is the US Military has essentially come full circle and we are back where we were decades ago with two separate issue shelter systems. The USGI poncho or tarp continues to be the primary tactical shelter available to soldiers. And single purpose one and two person pup tents are available for bivouac and base camp situations like the Army’s Improved Combat Shelter. Albeit these are absolutely much better tents than their canvas ancestor. All of the items I’ve talked about do what they were designed to do quite well. Some are a little heavier or bulkier than others but not by too much. For me it came down to options and color scheme. If I knew I was going to be living out of a hooch for any length of time I generally preferred a tarp since it was roomier. If I was just carrying something for contingencies but didn’t expect to use it much I usually went with ponchos because they took up the least space. A key factor was always what camouflage pattern available to me would blend best with the terrain and season I expected to be working in most often on any given trip. 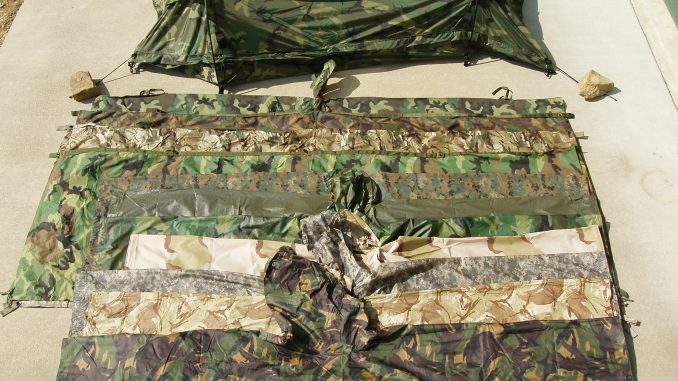 The examples shown (top to bottom): Ecotat nylon in tent mode, Ecotat Gore-Tex, British DPM woodland tarp, British MTP (Multicam variant) tarp, M81 woodland commercial tarp, USMC MARPAT tarp, USGI OD green poncho, woodland poncho, post Desert Storm commercial tricolor desert poncho, UCP poncho, Gulf State DPM desert poncho and Dutch DPM woodland poncho. As a side note: all the ponchos except one have small hoods designed to be worn under helmets. The Dutch poncho and the Ecotats have much larger hoods designed to be worn over helmets. I found the M81 woodland items were usually a good camouflage option in most temperate locations in spring and summer. However, I felt the DPM woodland worked better in some of the African countries I visited. I carried the desert variant DPM poncho most often in GWOT and found it especially appropriate for many places in Afghanistan. If I had gotten the MTP tarp sooner it would have worked at least as well and probably better in some locations. The newer MARPAT tarp might be a good choice if you are switching between widely varying environments since it is reversible woodland / coyote. And this may surprise some people but I found the UCP poncho worked quite well in some terrain overseas and even here on my homestead it is better than the woodland options during the late fall and winter months. If in doubt I went with the OD green poncho. It worked reasonably well in almost any terrain or climate. Bottom line: I highly recommend always carrying something that can be used to make a tactical shelter YOU can live with anytime you expect to be in the field. And in my experience any one of these military issue items would be a suitable choice.